Babblings of a Mommy: Faux Fur + Vests = My Newest Obsession. Faux Fur + Vests = My Newest Obsession. It's October and there must be something in the air because I'm totally obsessing with fur vests this season. I've N-E-V-E-R, ever been a fur person but this season I'm all over this fall staple! 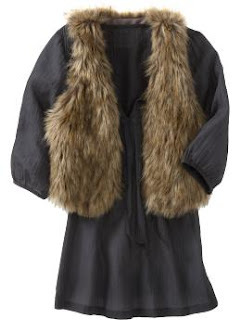 I've even bought my daughter a faux fur sweater vest from Gapkids that I'm DYING to put on her. If you're on the market for a faux fur vest, you're in luck because there's a lot of good options for any budget! Can I just tell you, I have ALWAYS loved vests, especially fur. I go to Argentina and stock up on super cheap ones and rock them all winter long. Love these! Rachel Zoe has good ones too. Pls take pics of your daughter! I want to see mini ones!! Mommy's sippy cup: The old navy one IS really cute and really affordable!! Love fur vests! Though my attempt to accessorize with one wasn't quite successful. Bought Romeo & Juliette Couture with the studded belt last year and ended up looking so boxy and like 20 pounds heavier. Terrifying! Well, I think I'll try again, but offline this time. Really have to try it on first.